I’ve spent a fair amount of time over the past couple of months reading various opinions on the latest Bordeaux vintage, receiving emails about the quality and release prices of said wines, and generally thinking so what? I’m not into investment wine; I buy wine to drink and enjoy now. 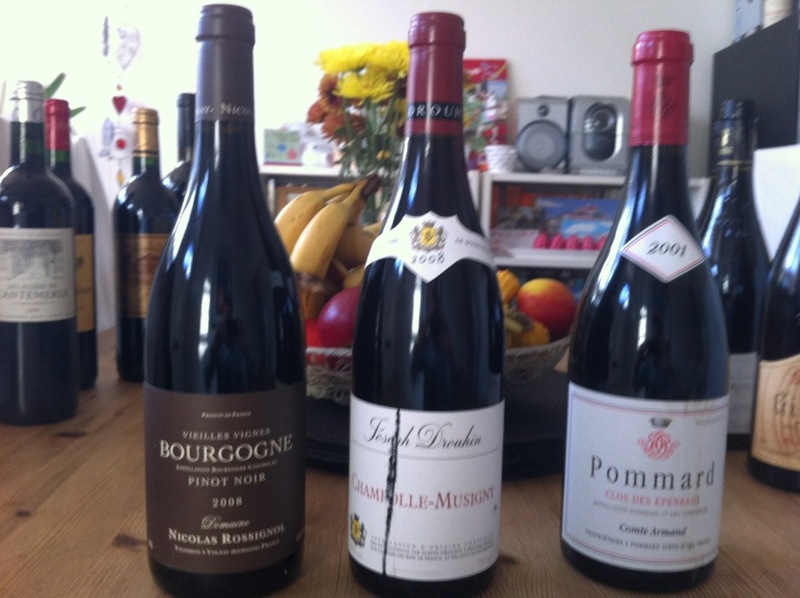 I have a few prized bottles that I picked up in The Rhone and Burgundy last year that require a few years and I’m prepared to wait for them, but that’s as far as my long term plans stretch. However when I saw a competition on Jancis Robinson’s website to win tickets for the forthcoming Bibendum tasting I though why not give it a go… And a couple of weeks later I was delighted to receive a congratulatory email to say I’d won a pair! 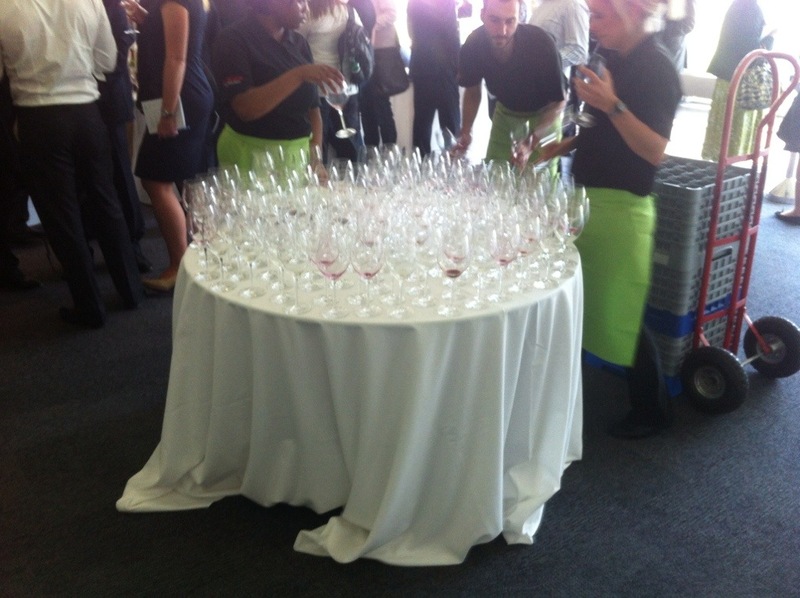 This was the 8th Bibendum Bordeaux tasting and took place in the wonderful surroundings of Lord’s cricket ground – I was at the test match at Lord’s a few weeks ago and didn’t expect to be back quite so soon! 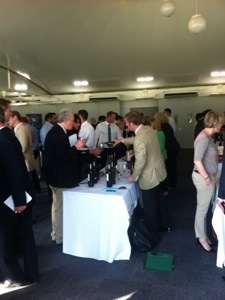 This is the biggest Bordeaux tasting event in the UK and is open to us mere consumers as well as those in the trade. What I particularly like about the event is a) the opportunity to meet some of the winemakers and b) each Chateau is asked to bring a second vintage if their choice to taste alongside the latest release. With over 70 Chateaux present this was certainly the place to explore the 2012 vintage. The nursery pavilion at Lord’s is a wonderful space and the room is laid out in a series of long tables, with each of the appellations grouped together. 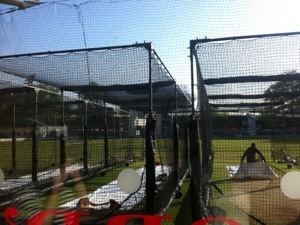 Its a great way of establishing the winners of the vintage. Overall I found that the 2012s showed lots of fruit – plenty of blackcurrant and cassis, but perhaps lacking concentration and maybe a tad green, particularly on the Left Bank. The Right Bank appellations of Pomerol and St Emilion certainly shone but I was also impressed with Margaux and the ever consistent St Julien. But the real winner for me were the whites of Pessac – I’m new to white Bordeaux but I’m looking forward to giving these wines a fair amount of attention when I visit the region in July. Delicious mix of black fruit, violets and minerality. Very fresh with lively acidity. The second wine Calon showed was 2007 which I didn’t enjoy and was nowhere near the quality I tasted at a recent vertical tasting. Lots if fruit and freshness with good concentration. Also really enjoyed the 2007 on show. Good value for sure. Very elegant by Pauillac standards, reminiscent of summer pudding. Definitely a better wine than Comtese de Lalande in 2012. Super concentrated, polished, with delightful minerality and spicy back notes. I think this will be a cracker in 10 years time. Langoa Barton was another good wine with bags of fruit front and centre. I wrote down “best so far” after tasting this – delightfully elegant, yet muscular and beautifully structured. Lots of cassis but just a hint of red fruit too. Lovely mixture of red and black fruit, soft almost buttery texture with lashings of acid. A fine and delicate wine, simple but delightful. The 2004 was also delicious and just about ready to drink now. Fruity, fragrant, concentration and very charming. Took me a while to get my head around this one as it was almost backward. Not a lot on the initial attack but a wonderful elegant finish. Lots going for it and I’m looking forward to my visit in the summer. Pure class with lots of fruit combines with a spicy and exotic finish. I will happily pay for a ticket to next year’s event! Auslese – more body and more tropical flavours. Trockenbeerenauslese – even more concentrated, more sweet, and more expensive! The word Trocken on a German wine label means dry – these are becoming more popular these days as wines from the German regions are becoming popular again. 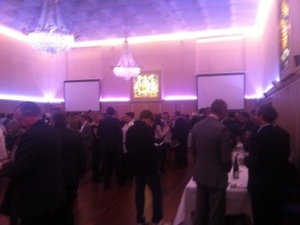 … Until I attended a tasting of wines from legendary German estate JJ Prüm at West London Wine School earlier this week. The Prüm family have had a presence in The Mosel region for over 400 years. 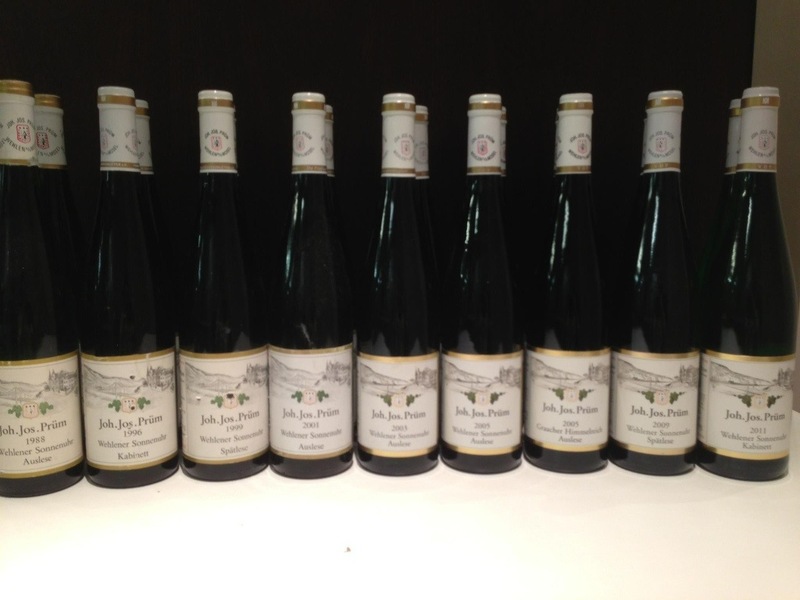 The estate was founded in 1911 by Johann Josef Prüm and has 33.5 acres of vineyards planted only with only Riesling. The wines are characterised by their purity of fruit as well as by their distinctive mineral character, and have a reputation for ageing superbly. The Fish is also a big fan of Rieslings and she joined me at the tasting, which was arranged as a series of flights. I’ve written recently about how I like to taste wines in pairs so this was right up my street. And the wines? Just wow. 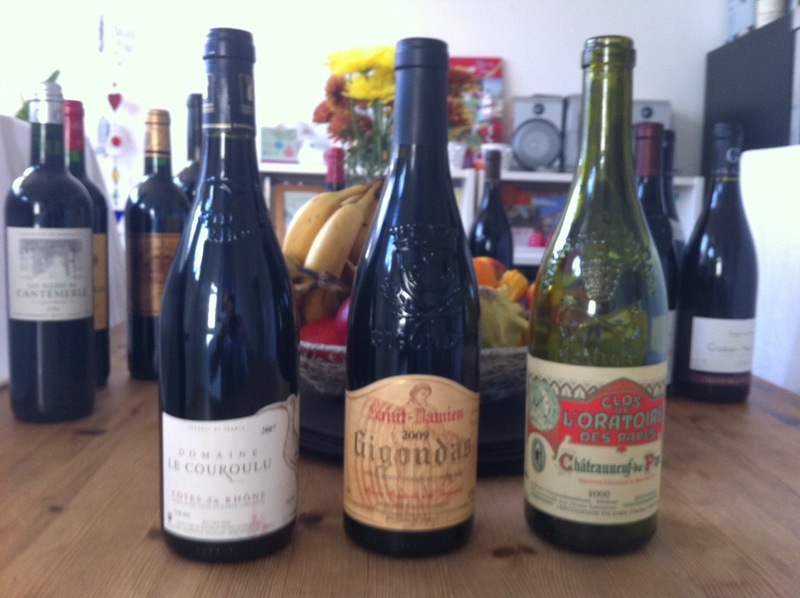 Read on for a full rundown of the 9 wines we tried and look at the prices; for fine wines they are remarkably good value, especially if your benchmark is Bordeaux or Burgundy. The first two wines were Kabinetts from the Wehlener (the town) Sonnenuhr (the “sundial” vineyard). Kabinetts are generally thought as having a lifespan of about 5 years from the harvest, but the 1996 showed that even at this level, JJ Prüm wines are made to last. The next set of wines were from the same Wehlener Sonnenuhr vineyard, but this time at the Spatlese level – you’ll see from my notes that I preferred the Kabinetts… I can be a really cheap date sometimes! The next pair contained my wine of the night. We moved up to Auslese level and compared two different vineyards from the highly rated 2005 vintage. The first again from Wehlener Sonnenuhr, the second from Graacher Himmelreich, translated as “the kingdom of Heaven”… And boy is it! For the last set of 3 wines, we remained at Auslese level from Wehlener Sonnenuhr, tasting a further 3 vintages, which highlighted the consistently high quality of the winemaking at JJ Prüm. Apologies for the long food intro… Just skip to the menu if you’re only here for the wine; I will get to the dark/blind tasting bit! As is tradition on our trip to Devon, me and The Fish cook for the guests on one of the evenings. 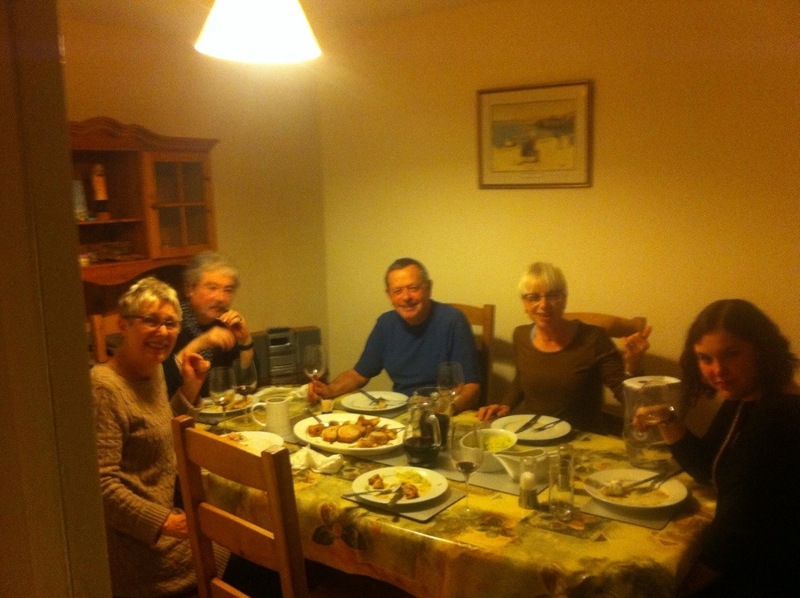 The guests consist of Den & Jan (the in-laws), and long term Devon devotees Richard & Sue; all of whom are fans of great food, and have enjoyed plenty of top nosh by the time our turn comes around. The plan was to go down to the tiny fish counter on Beer beach and choose what looked good and go from there. In my mind I’d planned scallops as the focus of the starter and maybe brill or sea bass for main course (I’d even picked some wild garlic earlier in the week to finish off a beurre blanc). Unfortunately the weather was against us and many of the fishermen hadn’t been able to go out in the windy conditions. Plan B consisted of a trip to Sidmouth to see what was to offer there. The fishmongers in Sidmouth, behind the lifeboat station, were able to supply me with the scallops I was after but the rest of the fish was looking a bit tired and uninspiring. This meant a Plan C was needed! If any of you are fans of Rick Stein like me then you’ll remember the episode of Food Heroes where Matthew Fort’s brawn has gone mouldy and Rick ends up in a Sidmouth butcher to see how brawn is made… That’s where I ended up too. Devon produces some fantastic pork and I spotted the pork loin I wanted as soon as I entered the fabulous shop. 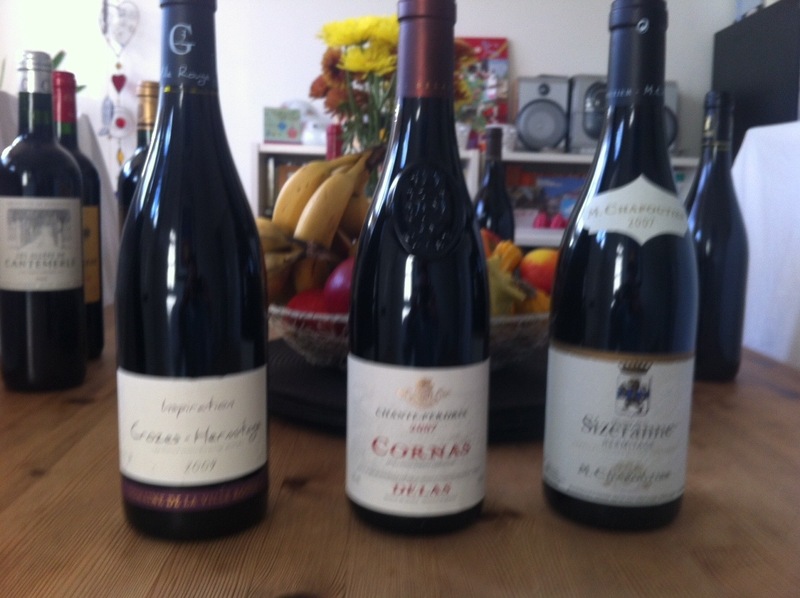 As I hadn’t planned to cook meat for the main course it meant going wine shopping! We came across and well stocked and very friendly wine shop on Sidmouth High Street, called, quite simply, “The Wine Shop”. I was hoping to find a Riesling from the old and new world but wasn’t that taken by the choice so I decided to go a bit left field. 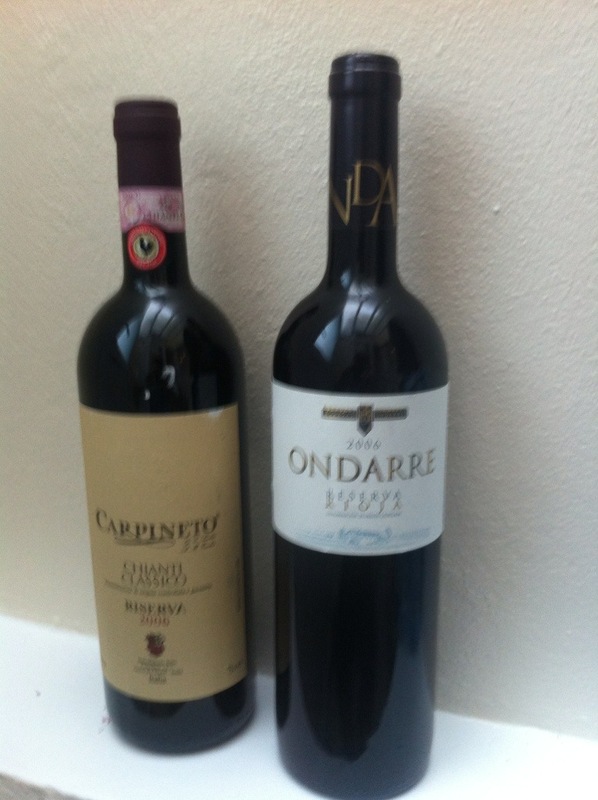 I also decided not to take my own advice (see Easter feasting) and went for two classics, two crowd pleasers… Chianti and Rioja. Now, we’d been comparing pairs of wines all week and this was too good an opportunity to turn down. As well as seeing what everyone preferred I upped the ante and went for a blind challenge… Oh what fun they all thought! As I like to have a common theme to the pairs of wines, they were both from the 2006 vintage, and Reserva/Riserva, so each aged for around 3 years. I decanted the wines into jugs about 2 hours before dinner and asked each of the guests for their preferred wine if they had to choose. 3 went for Chianti (my choice) and 3 for Rioja. This is all going well! 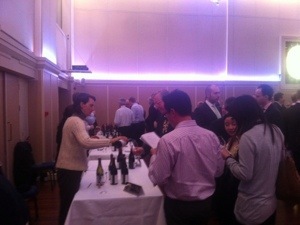 We then got to the fun bit of identifying the wines. The discussion went on for a good 20 minutes before I asked everyone to make their guess, after tasting both wines. Again 3 were right and 3 off the mark. Amazingly it was the three men who got it right. But don’t worry, I’m not reading too much into that! 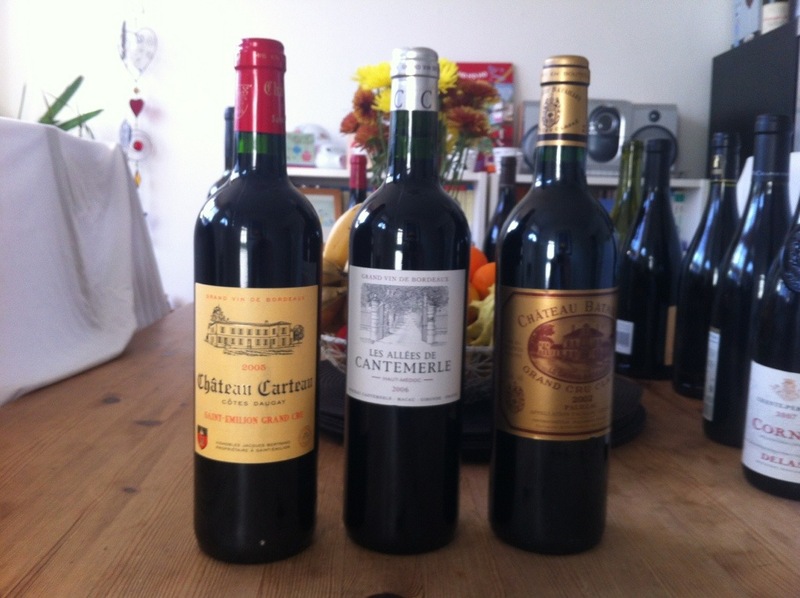 Three of us chose our pre-taste favourite as our preferred choice of the 2 wines – one of them (no names!) chose the Chianti at the start and the end, but identified the wrong wine. 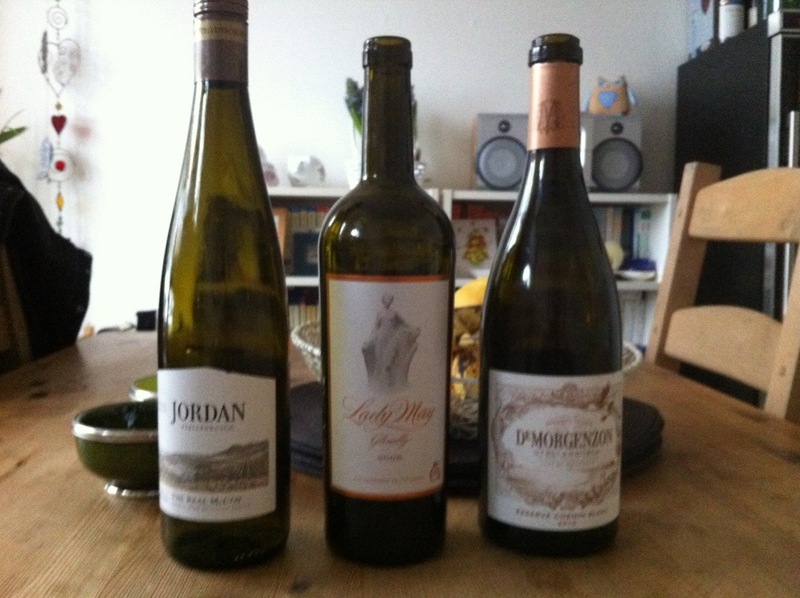 Anyway it was a fun way of drinking and discussing wine, and both bottles were very pleasant. I can’t wait until the next one! If there are a few of you together for dinner then give it a go – it certainly puts the wine at the centre of the evening and makes you realise how much you do or don’t know! The subject of wine appreciation scares people when it shouldn’t at all. The great thing about wine tasting is there really isn’t a right or wrong answer, simply your own conclusion. There are only three things you need. Your eyes, your nose, and your tongue. Couple that with a half decent vocabulary and away you go! Keeping notes of the wines you drink is a great way of learning what you do and don’t like. Your notes will help you when you’re choosing wine in the shop or in a restaurant as you will be able to tell your server your preferred grapes or styles. Keep your notes simple! If a wine doesn’t smell or taste like sweaty saddles or you don’t even know what that means (who does??) then don’t use the phrase! First things first… Don’t overfill your glass. You can always refill it! Leave plenty of room for the wine to breath and give it a good swill in the glass. In simple terms, using your eyes can tell you how fresh the wine is. What colour is it? If its white wine is it pale and watery, or golden and shimmering? It should be clear and bright. If not you might want to open another bottle! If so then you’re probably ready to move to stage 2. With experience you can start to identify elements of age and even origin by sight alone. Probably the most important part of tasting – scientifically speaking, most of what we think we’re tasting, we are actually smelling. Apparently! Use words and comparisons you recognise. Here’s some useful start points: fruit, flowers, spices, oak, animal (really! Is it meaty? Syrah often smells like smoked bacon). If you think its spicy, can you be more specific? Is it pepper, clove or star anise? If its pepper is it black pepper or white? Can you recognise the flavours you smelt? If you thought it smelt of citrus, does it taste of lime or lemon? Always try and narrow it down. Can you taste any sweetness or how about acidity? Acid makes your mouth water. Is it light or full bodied? And how long does the taste stay in your mouth – does it have good length? And there you go – you’ve written your first tasting note. Not that difficult and you can now compare this note with other wines to work out what you do and don’t like. Over the next few weeks I’ll give you some ideas that will help you explore different regions and grape varieties, learning as you taste. Until recently my only experience of South African wine had been with the indigenous Pinotage grape. I recognise the regions of Stellenbosch, Constantia and Walker Bay on a label, but that is about all. Having said that, the DeMorgenzon Chenin Blanc from Stellenbosch did make it into my top 3 wines of 2012 so it is definitely due a closer look. Pinotage is a bit of a Marmite wine amongst wine drinkers. The grape is actually a cross between Pinot Noir and Cinsault, “bred” by Professor Abraham Izak Perkid at the University of Stellenbosch in 1925. Personally I am a big fan and have never encountered the “ripe banana”, “cheesy” or “metallic” descriptions that often appear in reviews of the wines. I find the wines to be intense and savoury, with low tannins a velvety texture. Where I do draw the line, however, is with “coffee Pinotage”, which really does do what it says on the (coffee) tin. If I never taste one again it will be too soon! The wine region of South Africa is situated at the South West tip of the country, where the cool current from the Atlantic creates a cooler Mediterranean climate, and perfect conditions for wine growing. Many of the wines you will find on the supermarket shelves are made using international grapes so there really is nothing to be frightened about! The hub of the South African wine industry is the area centred around Stellenbosch. The region is producing excellent Cabernet Sauvignon and good quality Pinotage on the red front, and Chenin Blanc and Sauvignon Blanc on the white side. A bit further north is the region of Paarl, which produces good quality and good value Chenin. The Constantia region is one I always associated with Pinotage so was very surprised to read that Sauvignon Blanc represents a third of the regions vines, followed by Chardonnay and Cabernet Sauvignon. Swartland is quickly gaining a reputation for quality Syrah (often blended with other Rhone varieties) and Chenin Blanc from old vines. One of the southernmost and coolest regions is Walker Bay, which is starting to produce some very high quality Pinot Noir and Chardonnay (similar to the growing reputation of Tasmania in Australia). 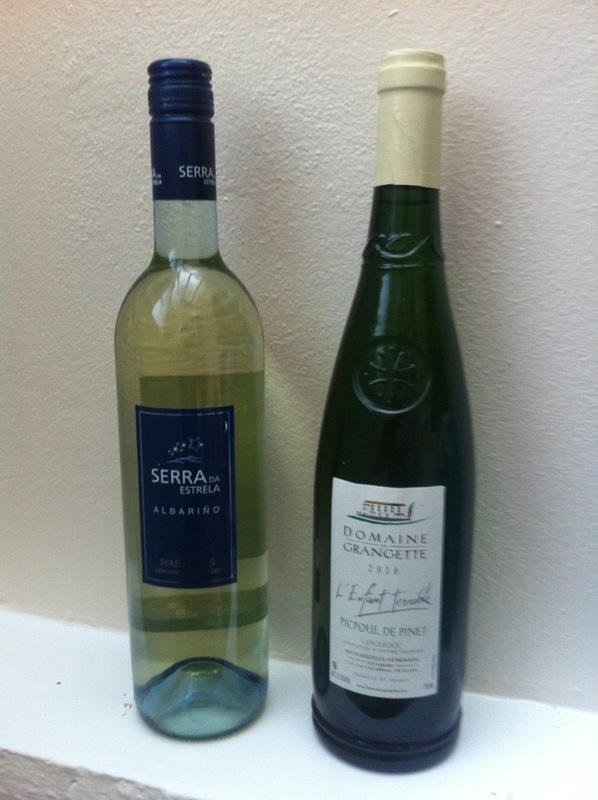 Here’s some of my tasting notes, which include two excellent whites.